It’s no wonder the Mazda Miata is one of the late 20th century’s great automotive success stories, because it offered all the fun of a light, rear-wheel-drive European convertible sports car everyone wanted, except it would actually start in the morning. 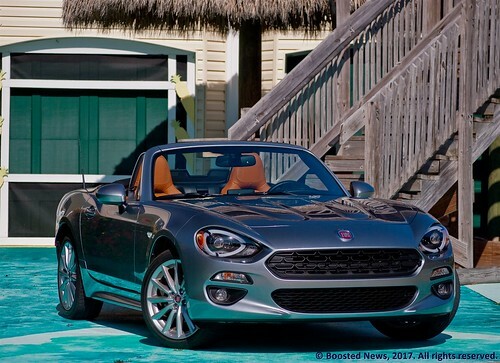 So, when Fiat’s return to North America included plans for a convertible roadster, FCA decided it would be best to just let the new masters from the East do what they do best. Though the new Fiat 124 Spider’s design hearkens back to the original Fiat 124 Sport Spider of the 1970s, it, in fact, is built by Mazda in Hiroshima, Japan, right alongside the current Miata with which it shares its architecture. 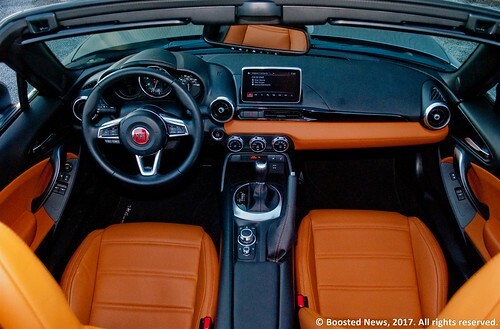 From the driver’s seat, the dashboard, gauge cluster, HVAC controls, and entertainment system are all straight out of the Miata, and the only difference is the Fiat logo on the steering wheel rather than the Mazda logo. There is one crucial difference between the two: the engine. Rather than Mazda’s 2.0L naturally-aspirated 4cyl, the 124 Spider has a true Fiat engine, the same 1.4L MultiAir turbocharged and intercooled 4cyl found in the 500 Abarth. 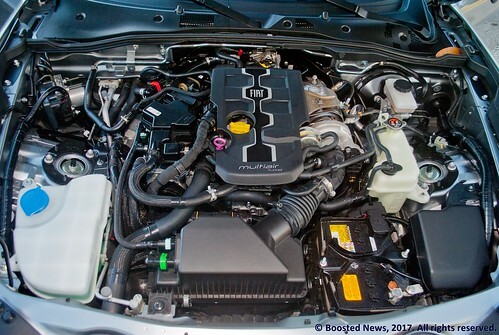 The tiny little turbo engine makes slightly more horsepower than the Miata’s engine and a lot more torque, and while it doesn’t make the same piercing exhaust growl that the 500 Abarth does, it still has a rorty bellow under full throttle that the Miata’s engine could never match. The extra output is good for a 6.8 second 0-60mph time and a 15.2 second quarter-mile time at 89mph. As are many modern turbocharged cars, the turbo is designed for quick boost at low rpms and the 124 Spider feels quite spry in low-speed crowded city situations. In theory, then, the 124 Spider should be the best of all worlds. It has the reliability and craftsmanship of a Japanese car, and not just any Japanese car, but one of the most important sports cars of all time, yet, it has some Italian flair and personality. However, I didn’t get quite what I expected from the 124 Spider. When I got inside my test vehicle and found the clutch pedal missing, my heart dropped. A vehicle like the Fiat 500L? That’s automatic only, and that’s no problem. The number of people who are walking away from a 500L because it doesn’t have a manual are zero. But a two-door convertible sports car? An automatic shouldn’t even be an option, in my opinion. The Aisin six-speed automatic in the 124 Spider is the same automatic that is, but shouldn’t be, in the Miata, and it’s a perfectly good transmission. Shifts are quick and smooth, and manual mode is even a true manual mode that will not upshift until you tell it to, even if that means bouncing the engine off the rev limiter. 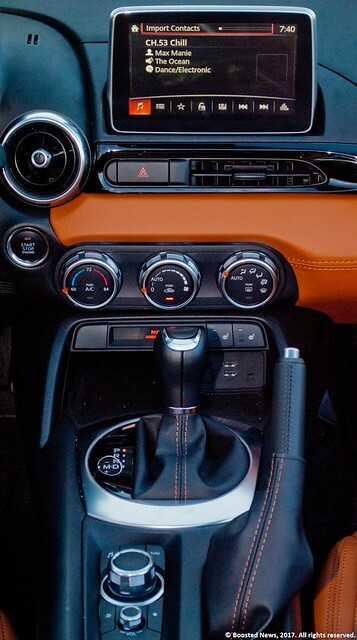 But the 124 Spider should have a legitimate three-pedal manual gearbox and nothing else. It just isn’t right without one. The handling characteristics also initially caught me off-guard. My test vehicle was a Lusso, which is the most luxuriously appointed 124 Spider, and that became apparent when I stuffed it into a corner. I recorded 0.88g of lateral acceleration, which is a commendable number, but that’s not the level of grip I would expect from a sports car based on a Miata. The chassis is excellent and very stable, with the rear just willing enough to help steer the car without it feeling loose. But the body roll is quite pronounced, which explains why the ride quality is surprising in a good way. 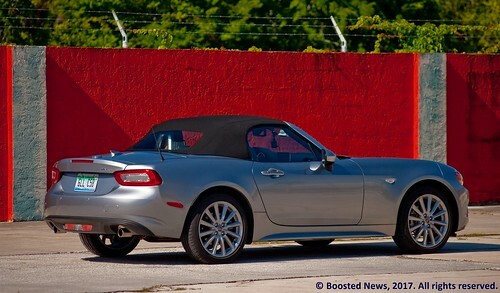 The 124 Spider Lusso is undoubtedly the best ride anyone will get in a Miata. The $3,795 Premium Collection package adds features like navigation, adaptive and auto-leveling LED headlights, as well as radar parking sensors and blind spot/cross traffic monitoring, and then you have what seems like more equipment than a minimalist sports car should have. But as I racked up the miles, it became clear what the 124 Spider’s purpose in life is, at least in Lusso guise. 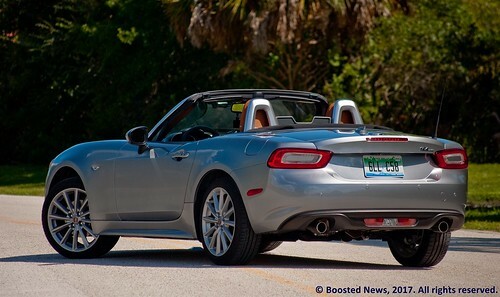 It’s a proper homage to the original Fiat 124 Sport Spider from 40 years ago. Back then, the Lotus Elan (which had a 4-wheel independent suspension) was the dedicated, higher performing sports car, while the 124 Sport Spider (which had a live rear axle) offered a more civilized driving experience and Italian chic appearance. 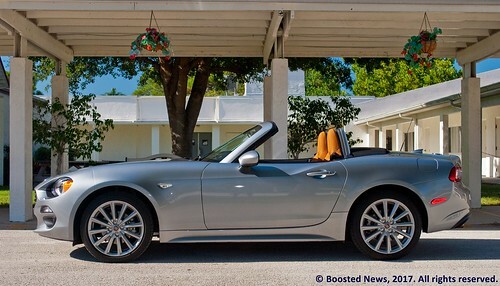 Whereas the Miata is a sports car that caters to the driving enthusiast, the 124 Spider is a personal car. It’s not for someone who knows how MultiAir works or cares that the turbo generates 22psi of boost. It’s for someone who wants to make an arrival, someone for whom style matters most of all, and with the help of the folks at Mazda, that stylish arrival can be consistently on time. The 124 Spider, like the rest of Fiat’s lineup, is a fashion statement, and at over $33,000 as tested, it’s a statement that comes at a price. Test vehicle provided by Fiat Chrysler of North America.